If you change the way you look at thing, the things you look at change. when I was in austin I picked up a magnet with the above quote above, there was no credit given to who coined the expression, but googling it I found it is attributed to wayne dyer, a contemporary "motivational speaker" and "self-help book author". I would not be surprised however to find that he 'borrowed' the saying from some anceint proverb - it does has that feel about it. today I'm heading out for day two of my week of jury duty. I wasn't called yesterday ...but who knows what will happen today. 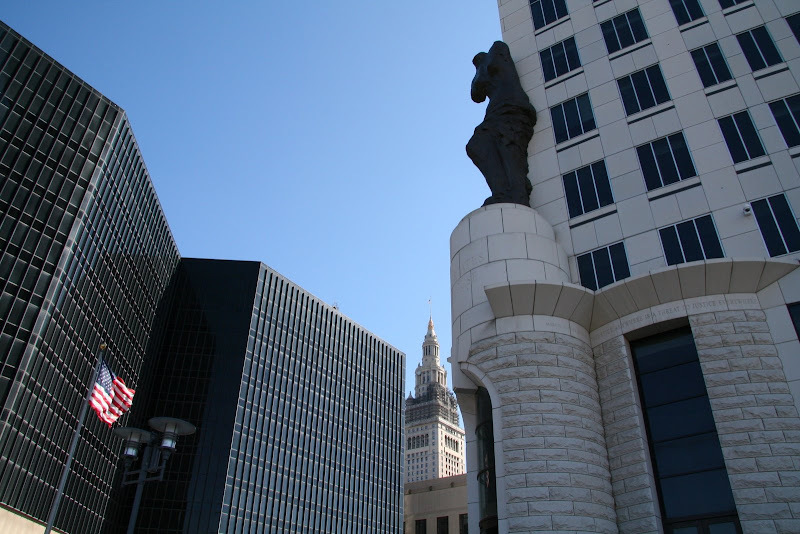 according to the bailiff who provided yesterday's orientation, the cleveland courts are among the busiest in the state of ohio. okay, gotta go, can't be late! Wow! That's a pretty cool-looking courthouse. Heh, heh! Here in Newport ours are early American (Federal style in this case) brick structures. We make up for a bland style with an abundance of history. Hope you have more than one good book to keep you company while you're swimming in the jury pool. What time do they let you leave each day that you're not selected for a jury? jury duty - that must be an interesting experience. Great song and couldn't help noticing that chilling poster in the vid: 'Please don't give to beggars, they cause traffic problems.' Right. You know, I've never been called to jury duty. They do it by phone here now, so you don't have to show up unless something is actually coming to trial. Then you do have to go through the whole being selected thing. Nice shot! Mom called called to jury duty( 1st time ever, in over 30 years of living here )! She can't serve due to her dialysis( and being legally blind doesn't help her to "see" the evidence ), so had to get a note from her doctor; she felt like a little kid. I've served on two panels and called up for a third( that I didn't serve on ). Interesting watching how the justice system can work, up close. Wayne's observation is SO true. Love the angles you got on the buildings. The quote is so simply true. If you figure out a way to look at jury duty as a lovely thing (in a new way, I assume) then you are really getting somewhere! Love the old church nestled among the skyscrapers. I love our cityscape too, must take a few more shots like that. Good luck with jury duty. A lot of waiting around for all accounts, Clare had to do it recently but wasn't selected. D was once called to jury duty in another town in the county we lived in. The day he had to go was snowy, miserable. He finally got there, to find the main door locked. He went around to the side, gained entrance, only to find that the courthouse was no long a courthouse! I really like that saying. Neat looking cityscape. Dude, I have jury duty on Thursday. Here in Hooterville we only have to go once, unless we are selected.